Most shoppers come in to your store with one question on their minds. “How many dinners can I get out of one grocery visit?” They need new ideas. 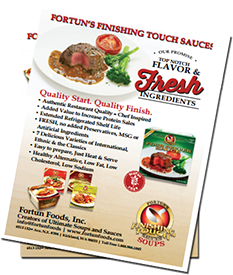 Fortun’s Finishing Touch Sauces provide those ideas, and you’ll reap the benefit in additional sales. You’ll sell more meat and fish because these finishing sauces will inspire consumers to prepare entrees in new, easy, and delicious ways. If they can find one more dinner idea when they’re in the store, they’ll buy one more package of meat for that extra meal. Your sales will increase. Consumers want quality food products. They look for something new and innovative, with fewer chemicals and preservatives, less processing, fresher ingredients, and more ethnic and international choices. They’re looking for top value. Fortun’s Finishing Touch Sauces bring an advantage to your business and benefits to your bottom line. 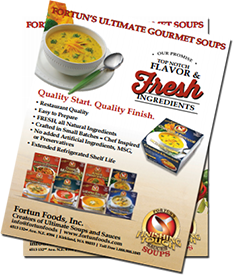 Fortun’s Foods will offer in-store demonstrations to enhance the customer’s experience along with your profitability. Non-exclusive distribution will begin on the West Coast and then move east. Save time and add value to your deli counter, too, by serving Fortun’s Finishing Touch Sauces with your ready-to-eat foods. Contact us today for more information on how we can help you ramp up your sales. From restaurant chefs to school cafeterias, from caterers to retirement communities, everyone in the food-service industry can benefit from Fortun’s Finishing Touch Sauces. They add exotic flavor while eliminating labor-intensive preparation. Gourmet meals can be prepared in just minutes. 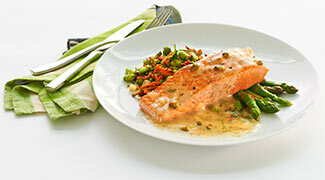 These savory sauces are carefully simmered with wholesome, eye-appealing ingredients. Simply heat the sauce and add to cooked chicken, beef, pork seafood, or pasta for meals that your clients will rave about! For more information, please contact Mary Shepard, National Sales Manager. Office 503-747-4515 or cell 503-539-1801 or e-mail mary@fortunfoods.com.